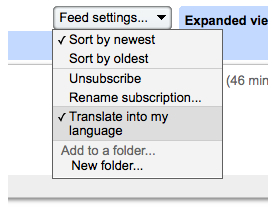 Ever wanted to subscribe to a feed in a language other than one you understand, and have Google automatically machine translate it into your language? Now you can. Of course, machine translation is usually terrible. I worked in software localization for a few years, where I learned first hand just how far out the idea of usable machine translation is. But hey, it’s better than nothing, and is a nice option for that Chinese or Russian blog you REALLY wish you could read. I tried this out on the feeds for the Intel Software Network blog in Chinese and Russian, and it seems to work pretty well (as well as Google Translate ever does). Pretty slick. You are perfectly right, the automated translation software is far from perfect but as google is rolling out their translation center for human translators they will have a huge database to play with which may put many translators out of business. I wouldn’t like something to translate text automatically for me. I would like to have things translated only when I need them! I use moztrans http://home.interlecta.com/desktop because I can select the text and translate it only when I want.